The best hunting tents are your base of operations in the outdoors while you hunt and there are certain qualities to look for in a tent that protects you from the harsher conditions outdoors. If you spend most of your time in the outdoors, then you would know how a high-quality tent can affect your performance and overall stay. Whether it is snow or heavy rain and the wind, the best premium quality hunting tent serves not just as your source of protection and privacy but it also offers secure sleep and rest after a long exhausting day. The overall quality of the hunting tent mainly depends on its construction and the materials used that would determine how long it would last under the harshest weather conditions in various terrains. Your investment on a high-quality hunting and outdoor tent is a lucrative one especially if you intend to use the unit long-term and in the most demanding and rigorous environments in the outdoors. Kodiak Canvas 4-Person Deluxe Canvas Flex-Bow Tent. The tent is made from 100% cotton duck canvas materials offering durable and long-lasting function. It is also watertight to keep out snow and heavy rain while maintaining breathable and well-ventilated interiors for the summer or when the temperature spikes high. Kodiak Canvas 8-Person Flex Bow Tent. Made from the same manufacturer, Kodiak Canvas, this is a much bigger model compared to the Kodiak Canvas 4-Person Deluxe Canvas Flex-Bow Tent. 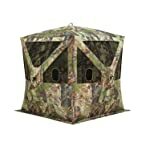 The size is the only difference between the two models since this hunting tent also comes with the Hydra-Shield technology that showcases the 100% cotton duck canvas construction. It is a huge and long-lasting canvas deluxe tent with watertight features for drier and safer interiors while the ventilated design keeps the inside fresh and airy during hot temperature or seasons. Elk Mountain Canvas Wall Tent. There are various features in this canvas tent that made it more durable and resistant to snow loads, heavy rains, and strong winds in the outdoors. On top of the durable and heavy-duty canvas materials, the tent comes with a ridge support that has been recently modified in order to withstand the weight due to heavy snow loads. The wire support system and angle kit that keeps the tent sturdy even during windy nights and days are features that both the Kodiak Canvas 4-Person Deluxe Canvas Flex-Bow Tent Kodiak Canvas 4-Person Deluxe Canvas Flex-Bow Tent and Kodiak Canvas 8-Person Flex Bow Tent models do not possess. You can go for a simple and minimalist type of hunting tent or go all-out and choose a more comprehensive and multi-faceted design. Different hunting tents have their unique looks and aesthetics but make sure that you also consider a much more important feature in terms of functionality. Heavy-duty and seamless tent designs make lucrative and wise buying decisions while a nice-looking outdoor base is a bonus. Kodiak Canvas 8-Person Flex Bow Tent. The large and spacious flex-bow tent have hydra-shield canvas materials for the walls and ceiling while the floor is made of polyester-reinforced vinyl complete with the welded seams to keep even the smallest bugs out. There are four windows around the tent with the no-see-um mesh for privacy and the 2 large D-shaped doors complete the design on the front and back. Elk Mountain Canvas Wall Tent. The water and mold resistant canvas white tent showcase the integrated sod cloth with a dual-layered canvas that makes up every frame. Unlike the Kodiak Canvas 8-Person Flex Bow Tent, this model comes with 6 windows with a zipper door, an evening opening, the stove jack and the interior pole straps to provide ventilation. The set also comes with a tent bag, 10 8-inch stakes, the stake bag, angle bag, and tensioners and ropes. Kodiak Canvas 4-Person Deluxe Canvas Flex-Bow Tent. With such a petite design, this 4-person canvas tent is the smaller version of the Kodiak Canvas 8-Person Flex Bow Tent model. Size is basically the only difference between the two models with the smaller tent having the same double D-shaped front and back doors and four windows with privacy meshes. Unlike the Elk Mountain Canvas Wall Tent, this tent features two funnel-flow vents designed for improved temperature management and airflow ventilation. Outdoor activities are oftentimes costly and investing on a premium quality hunting tent could be financially demanding. The best hunting tents need not drain your savings because there are affordable and reasonably priced units that are within your preferred budget range. Always look for a combination of quality and affordability in one unit and shy away from the cheapest models with obviously sub-standard and low-quality designs. Elk Mountain Canvas Wall Tent. If you are willing to shell out extra cash for a premium quality hunting tent, then this model is perfect for you. Although expensive, there’s a reason why this model is on top of our price scale. The tent is featured with a smorgasbord of innovative features for durability, design, and overall performance but sadly it doesn’t have readily accessible information on product warranty. Kodiak Canvas 8-Person Flex Bow Tent. Unlike the Elk Mountain Canvas Wall Tent model, the hunting tent boasts of its limited lifetime warranty protection. It is a mid-range hunting and outdoor tent that offers year-round use. Kodiak Canvas 4-Person Deluxe Canvas Flex-Bow Tent. The most affordable in our list is significantly cheaper compared to the Elk Mountain Canvas Wall Tent. However, it has competitively remarkable features with a limited lifetime warranty protection just like its bigger Kodiak Canvas 8-Person Flex Bow Tent counterpart. The best hunting tents serve as your home and sanctuary in the outdoors, in the midst of all the elements of nature, the harsh weather conditions, and the most challenging of terrains. It is not easy to find and choose the best model for a high-quality tent but choosing the best product based on Durability, Design, and Affordability brings you closer to a lucrative and wise investment. According to the criteria we listed and the different features of our top 3 hunting tent selection, we highly recommend Elk Mountain Canvas Wall Tent in the best hunting tents category. It scored highest in the Design, Overall Performance, and Durability segments and even with a significantly higher price tag, it is still worth every dollar you spend.